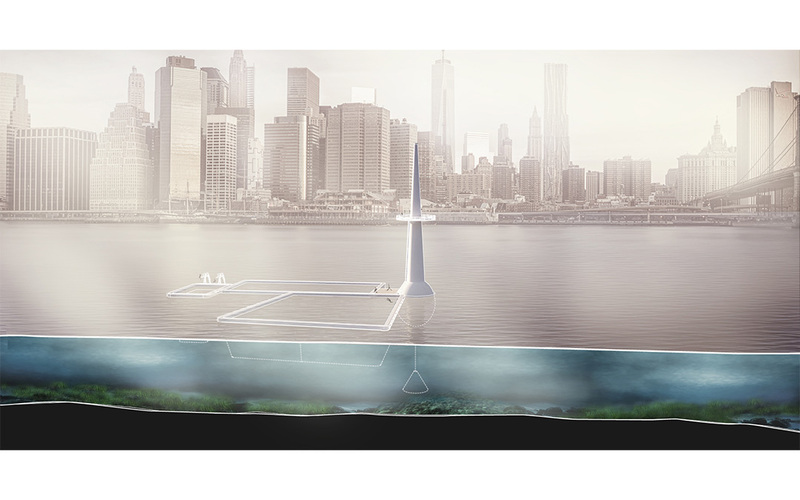 A recent competition run by Arch out loud has called upon students and professional designers to create a modern aquarium and park for New York City's East River waterfront. 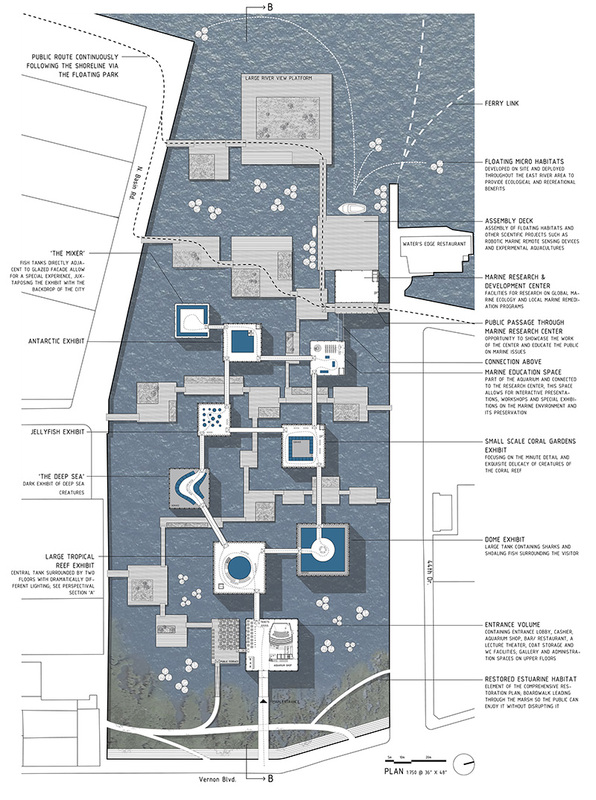 The proposal challenges entrants to redefine the conventional aquarium and examine its relationship to the urban context and the public domain. Located in the borough of Queens and surrounding city area, the water park will take advantage of the prime waterfront position for the public, whilst creating an iconic landmark for Queens itself. A total of 565 participants and 178 proposals from six continents and 40 countries have led to the winning proposal: 'NYC AquAtrium' from the Italian design team that includes Piero Lissoni, Miguel Casal Ribeiro, Mattia Susani and Joao Silva. What's key to the winning proposal is the dynamic system that has been created to interact with its environment, allowing visitors multiple ways to experience the water park. A large water basin would be dug into the river, with the Aquarium and the Marine Centre a submerged island reachable via a pathway. A beachfront spans the parking area to form a panoramic public space, while a boardwalk surrounds the basin and becomes a floating ring to connect the two waterfronts and encompass the Aquarium. 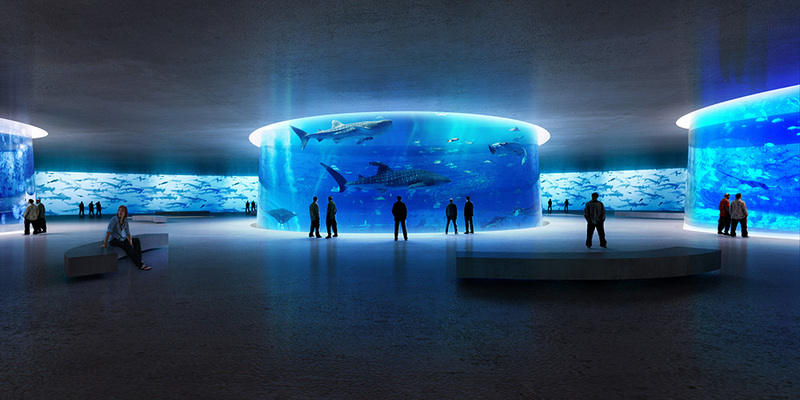 Three different levels allow visitors to explore a variety of sea life from new perspectives. 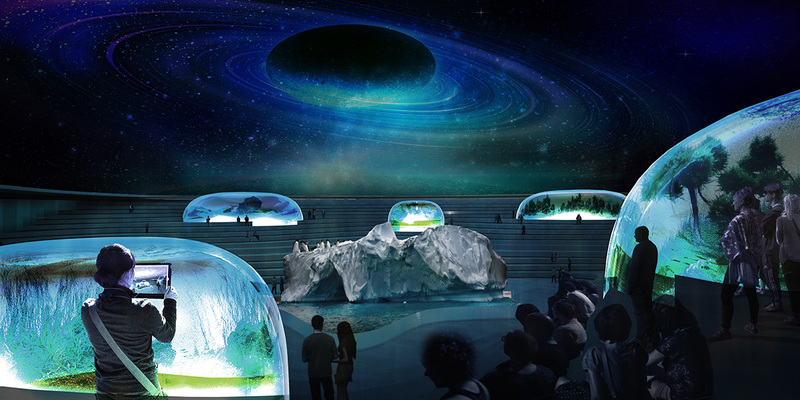 At night time, the Aquarium's sliding roof closes to transition into a planetarium. The area and biome domes within can then remain secure. In second position is Vers La Mer from Brooklyn-based designer Dominik Sigg. This design considers the rising sea levels and flooding that has occurred to explore 'maritime urbanism where built fabric of the city shifts from traditional solid ground to floating existence in harmony with the ocean', says the designer. 'Vers la Mer', aka 'towards the sea', takes advantage of the Queens Waterfront and Anable basin to fully showcase the area for the public. Built into multiple rectangular forms, the design appears like its floating on the water's surface and is accessed by walkways hovering over the water. 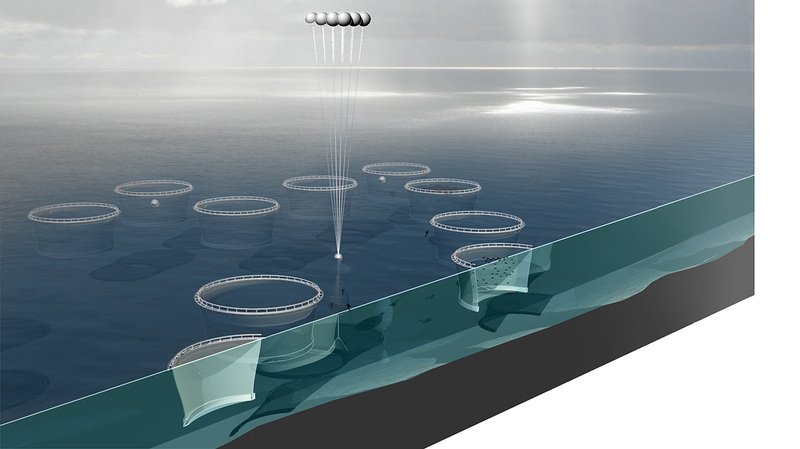 Floating micro habitats, robotic marine remote sensing devices, a marine research development centre, various exhibits for different sea life such as jellyfish exhibit, small scale coral gardens exhibit and Antarctic exhibit to name a few are just some of the many facets incorporated into this design. Third place went to the design from American team Rob Holmes, Laurel McSherry, Frederick Steiner and David Bayer. 'Merroir' strives for a twenty-first century aquarium whereby it moves away from an environment with animals behind glass and towards creating a series of opportunities and encounters for visitors to experience. The aquarium is placed at the centre of thirty diving bells scattered around the area and organised into three different types of diving bell. The three styles of bell networks allow audiences to observe in different, dynamic ways. These are: mobile bells based on aquatic habitats, cadastral bells based on the built environment and datum bells based on bathymetry (the study of underwater depth of lake or ocean floors) and sea-level rise.